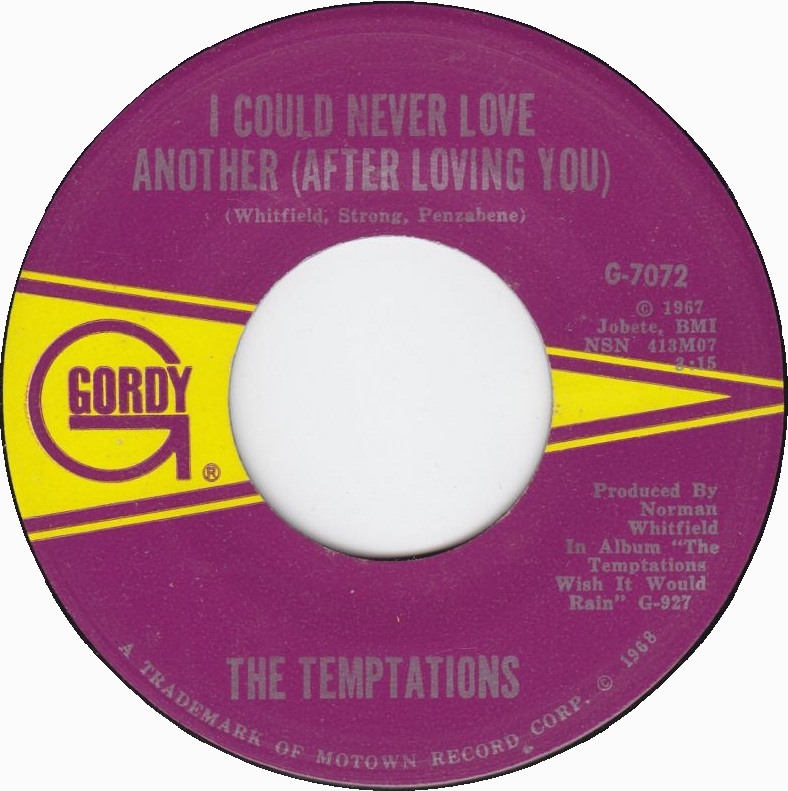 Soul Serenade: The Temptations, "I Could Never Love Another (After Loving You)"
David Ruffin’s final single as lead vocalist with the Temptations featured one of his finest performances. I know that the readers of Soul Serenade are astute music fans, but in case you were wondering about the inspiration for the logo that graces this column every week, well now you know. Yes, my colleague Dw. Dunphy was informed by the beautiful Gordy Records label when he was creating his wonderful design for me. It’s a really cool take on it, don’t you think? This week’s song is just one of those that popped into my head at one time or another and simply would not let go until I featured it here. “I Could Never Love Another (After Loving You)” is prime, classic lineup Temptations stuff from the spring of 1968. I have never made a secret of my love for the singing of David Ruffin. He was a complicated guy, and he died a terrible, lonely death far too young, but I think he was the greatest soul singer who ever lived. “I Could Never Love Another (After Loving You)” is among the finest performances that he ever committed to vinyl. It was also the last Temptations single to feature him as the lead vocalist. The single marked a far more permanent end for another another glorious talent as well, lyricist Roger Penzabene. The songwriter, who was also responsible for the previous Temptations hits “You’re My Everything,” and “I Wish It Would Rain,” based his lyrics on his own real-life heartbreak that resulted from the discovery that his wife was cheating on him. On New Year’s Eve 1967, just one week after “I Wish It Would Rain” was released, Roger Penzabene committed suicide. His note is all there in the lyrics of his final songs, and it is a sad but majestic legacy indeed. Listen to how Ruffin actually portrays Penzabene in the lyrics of the song, pleading with his wife not to leave him, and telling her that he loves her despite her infidelity. It is one of the finest examples of a singer inhabiting the lyrics of a song that you are ever likely to hear, and it still tears my heart into little pieces, even after all these years. David Ruffin was fired from the Temptations in June, 1968, even while the hit single was still fresh in the mind of the group’s millions of fans. He was accused of unprofessional behavior. Who knows? What we do know is that “I Never Love Another” made it to #13 on the Billboard Hot 100, and #1 on the Billboard R&B Singles chart. With Ruffin gone, and Dennis Edwards brought in to replace him, the Temptations soon embarked on a psychedelic journey led by producer Norman Whitfield. But those historic recordings are another story for another day.